Streets Ahead Style: My Indie Expo Canada Nail Polish Haul - A Macro Look! 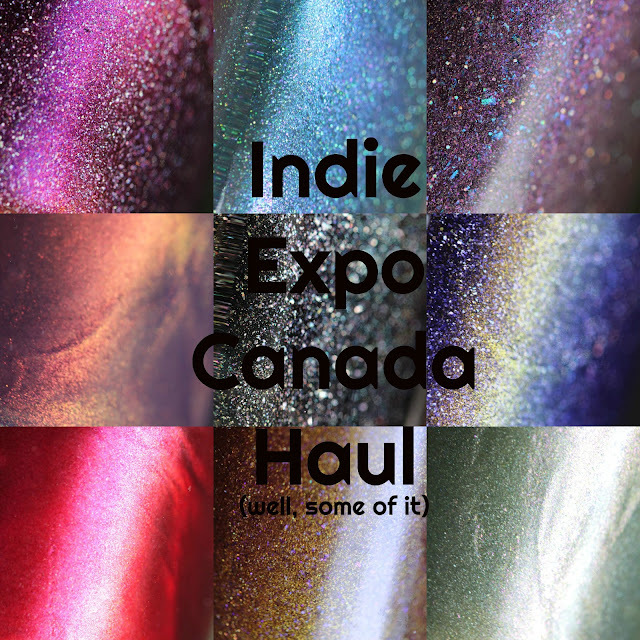 My Indie Expo Canada Nail Polish Haul - A Macro Look! How was Indie Expo so long ago? Here we are in the middle of July and the Summer is whizzing by. I've have naked nails for far too long but I'd just rather spend my time outside than inside painting them. All of the polishes I got at Indie Expo Canada in Toronto were very photogenic so I thought I would take some macros and share them with you all! Some of these were purchased at the event and some others were in the VIP bag. First up is Girly Bits Freeze Frame. I was SO EXCITED to find this because Girly Bits put out a few one-offs and box exclusives. Freeze Frame was from the Indies Outside the Box and I have been looking for this FOR MONTHS! It was meant to be because I left the Expo to grab some lunch and then thought to myself... I should go back in for one last look before heading home. I visited the Girly Bits table again and THERE IT WAS. An IEC miracle, no less. When I found Freeze Frame, I also spotted this Girly Bits prototype polish. It's a really beautiful golden caramel brown with purple iridescent glitters. I imagine this will be sheer but will build beautifully. I'm super pumped to try this one out especially in the Fall. Girly Bits The Red Rocket was the IEC Toronto Exclusive polish meaning it was only available at the event. It's a beautiful shimmery metallic red polish that I am excited to finally wear one day soon. Girly Bits Lost on the PATH is a really unique shimmery holo flakie hybrid and it's still available for purchase! Lost on the PATH is a deep blurple (blue/purple) shade with a strong gold shifty shimmer and silver holo flakes. Girly Bits Shake What Ya Mama Gave Ya (CoTM May 2017) is a really unique polish yet again from genius Pam. Shake What Ya Mama Gave Ya is a sparkling purple scattered holographic with amazing holo flakes, a lovely pink flash of shimmer and pink flakes, and purple flakes. The second half of this duo was Because I Said So. Girly Bits Shift Happens is a polish I have reviewed and worn before, many moons ago on this blog. It was in the original bottle too! How cute :) I sold it a few years ago but a few bottles were available at IEC so I grabbed one. I purged it in a mood when I wanted to get rid of everything but the regret settled back in shortly thereafter. Shift Happens is made of the fated Unicorn Pee - it is a dramatic colour shifing topper in a sheer red-purple base. I'm excited to try this over lots of different bases. This one might look familiar because I have already reviewed it on the blog here; it is Girly Bits What the Hell Was I Thinking? part of the June 2017 CoTM. Previously reviewed here on my blog, this is Let's Do This Again! AND I'm giving away the June CoTM duo on Instagram so hop to it! I haven't worn a Colors by Llarowe in A LONG TIME so I thought I would check them out again and I am so impressed (still, again). This is Can We Have Trudeau? which is hilarious and beautiful. Can We Have Trudeau? is a deep black with holo prismatic flakes. I am excited to wear this - I sound like a broken record! An IEC Toronto LE from Ever After Polish... License to Lacquer is a blue duochrome that shifts from teal to royal blue to indigo/purple with scattered holo and silver shimmer. So pretteh! These next two might be familiar to you because I've already shown them on here. This first bottle is Ever After Minty Me. Aaaaaand Tonic Polish One Million Flowers. The release date on these is still TBA but they're coming! Tonic Polish Taking on Toronto is a fun brown holo but it's described as a gunmetal grey holo with pink/gold shifting shimmer, ultra holo micro glitters and color shifting flakies. I think my eyes are off but it's gorgeous no matter what you call it! Lastly is Alter Ego Generous Beauty from the VIP bag which is a really pretty teal shimmer with holo flakies. The name was inspired by Pam, the woman behind Girly Bits and it's perfectly fitting.